Elisabeth of Bohemia was the daughter of Frederick V, elector of the Palatine (a German territory that was part of the Holy Roman Empire) and his wife, Elizabeth Stuart, daughter of James Stuart, the English king who had succeeded Elizabeth I as ruler of England. The journey of the elector of the Palatinate and his new electress to Heidelberg was equally lavish. Once in Heidelberg, Elizabeth gave birth to three children (she ultimately gave birth to thirteen), including Elisabeth, the subject of today's post. In 1619, Frederick and Elizabeth were offered the throne of Bohemia, and the golden couple became--briefly--king and queen of Bohemia. But Elizabeth Stuart is now best known as the "Winter Queen," signifying the brevity of her reign. Frederick and Elizabeth assumed the throne of Bohemia in November 1619--within a year, the Protestant couple had been run out of Bohemia by Frederick II, the Catholic Holy Roman emperor, who took possession of the Palatinate as well. The two were exiled, taking up residence in The Hague. Frederick V died in 1632, just thirty-six years old. The Winter Queen lived for another thirty years. She returned to England on 26 May 1661, just after the restoration of her nephew, Charles II, and died in London less than a year later, on 13 February 1662. A formidable woman who was a skilled player in the games of international politics, Elizabeth Stuart is now largely a forgotten figure. For a quick read, Lisa Jardine's "The Winter Queen of Bohemia," written for the BBC Magazine, will suggest why you need to know more about Elizabeth Stuart. And now for the subject of today's post. While her mother was, for more than thirty years, "one of the foremost power brokers for the Protestant cause in Europe," Elisabeth of Bohemia was an equally accomplished daughter. 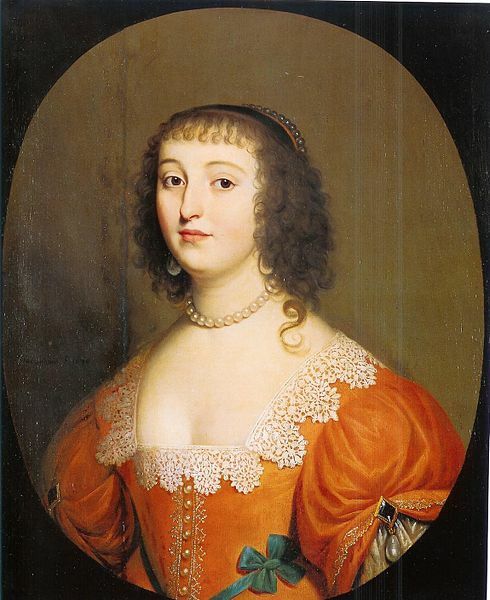 When her parents left for Prague in 1619, Elisabeth and her siblings remained behind with their grandmother, Louise Juliana of Orange, who had been regent of the Palatinate for her son, Frederick V--she had also discouraged her son from taking the throne of Bohemia, fearful of just the sort of religious conflict that did, indeed, erupt. Frederick V's deposition was the trigger for the Thirty Years' War. Despite the turmoil, Elisabeth received an excellent education. In 1639, she began a correspondence with the Dutch scholar Anna Maria van Schurman, whose response, filled with praises for Elizabeth Tudor and Jane Grey, acknowledged Elisabeth's English connections. Elisabeth met Descartes while he was in The Hague, and the two began a philosophical exchange--initiated by Elisabeth of Bohemia in 1643, the two corresponded until Descartes' death in 1650. Fifty-eight letters survive--thirty-two from Descartes and the remaining twenty-six from the princess Palatinate. In her excellent overview of Elisabeth of Bohemia's philosophical work for the Stanford Encyclopedia of Philosophy, Lisa Shapiro notes that Elisabeth is not merely soliciting answers from Descartes but is, instead, developing and expressing her own philosophical views. "It is evident from the correspondence," Shapiro writes, "that Elisabeth has a remarkable and wide-ranging critical philosophical acumen. Careful reading of her side of the correspondence does suggest she has some positive philosophical commitments of her own, on matters including the nature of causation, the nature of the mind, explanations of natural phenomena, virtue, and good governance." The correspondence . . . reveals her to have been involved with an appointment in mathematics to the University of Leiden and in negotiations on a number of matters, including the imprisonment of her brother Rupert in conjunction with his efforts around the English Civil War, negotiations of the marriage of her sister Henrietta, negotiations of the Treaty of Westphalia, and the finances of her family after the end of the Thirty Years War. After Descartes' death, Elisabeth returned to Heidelberg in 1653 where her brother, Charles Louis, had been restored as elector of the Palatinate. Disturbed by her brother's abandonment of his wife, Elisabeth managed to secure the release of her sister-in-law, Charlotte of Hesse-Kassel and move on with her to to Hesse. In 1660 she joined the convent of Herford Abbey. 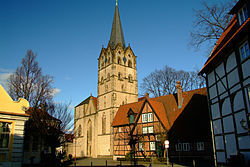 The eighth-century convent was the oldest in Saxony, at one time an imperial abbey within the Holy Roman Empire. Although it was now a Protestant convent, it retained its status, and in 1667 Elisabeth of Bohemia became its head, with the title of "princess-abbess." As Shapiro notes, Elisabeth also had a keen interest in political philosophy--this may have helped to make her an effective administrator of the convent, its lands, and the surrounding community; she also welcomed those from oppressed religious sects, in particular the Quakers, and engaged in an ongoing correspondence with members of the Quaker community. Of course you won't find an entry on Elisabeth of Bohemia in the Encyclopedia Britannica--the only mention of her is in the entry for Descartes, where she is mentioned in connection to his 1644 Principles of Philosophy: "He dedicated this work to Princess Elizabeth (1618–79), daughter of Elizabeth Stuart, titular queen of Bohemia, in correspondence with whom he developed his moral philosophy." Lisa Shapiro's edition of Elisabeth of Bohemia's correspondence with Descartes, The Correspondence between Princess Elisabeth of Bohemia and René Descartes, contains an excellent biographical and critical introduction as well as carefully edited translations of the original letters. You might also enjoy Elizabeth Godfrey's 1909 biography, A Sister of Prince Rupert: Elizabeth Princess Palatine and Abbess of Herford. It's available at the Internet Archive, by clicking here.